This is a very small production (175 cases) Viognier from a boutique winery in Washington State's Columbia Valley. There wasn't a lots of tech data on the DiStefano website so I'm kind of in the dark about how the wine was made. However, I do know it's made from 100% Viognier and I made sure to jot down my usual tasting notes to share with everyone. I love to taste wines made from this varietal because of the wonderful bouquet Viognier almost always has on display. Viognier to me is one of the most powerfully aromatic varietals, and I believe the nose is perhaps the most enjoyable part of drinking wine. 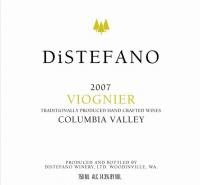 The 2007 DiStefano Viognier shows beautiful aromas of peach nectar, honeydew melon, lime pudding, and wild flowers. On the palate the wine starts off with a more citrus driven flavors profile, and then it shows some of the melon notes towards the finish. There is very sharp acidity displayed in this wine and I wrote in my notes that I thought it would be brilliant with shellfish! It does show a little too much heat on the finish and the alcohol is a bit lofty at 14.3%, but it doesn't throw the wine too off course. It finishes pretty long and with nice some really nice citrus notes. Hmm, interesting. Again I love me some WA juice. Have you ever had Bunnell Family Viognier? Delicious.